1092 Budapest, Kinizsi st. 27.
start time: Friday, 20:00 p.m. Participation is only recommended for determined and well prepared hikers and runners! People under the age of 18 are not allowed to participate in Galyavár 110 miles. The three fastest men and women to finish the trail are rewarded with medals. Participation is only recommended for determined and well prepared hikers and runners! People under the age of 18 are not allowed to participate in Galyavár 140. The three fastest men and women to finish the trail are rewarded with medals. Participation is only recommended for determined and well prepared hikers and runners! 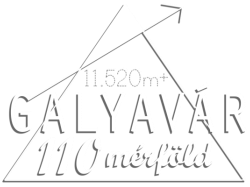 People under the age of 18 are not allowed to participate in Galyavár 110. The three fastest men and women to finish the trail are rewarded with medals. start time: Saturday, 7:30 a.m. Participation is only recommended for determined and well prepared hikers and runners! The three fastest men and women to finish the trail are rewarded with medals. start time: saturday, 7:00 - 8:00 a.m.
start time: 8:00 a.m. - 9:00 a.m. Difficult, technical trail, we only recommend participating for experienced, well-prepared hikers! start time: 9:00 a.m. - 10:00 a.m.
start time: 10:00 a.m. - 11:00 a.m. The route includes difficult, technical terrain: participants are expected to be cautious. Obligatory online registration for all distances from 15 August till 4 November. Discounted registration till 16 September. Every distance takes place on the same 7.38 km route. The only difference between the distances is that the participants have to finish more or less rounds on the same route and naturally they get different services and rewards, too. Participants can only do the rounds counter-clockwise! The route includes difficult, technical terrain: participants with less experience are expected to be exrtremely cautious. Every participant takes part in the event on their own responsibility. In the case of extreme weather conditions the organizers maintain the right to expand the time limit.